I have seen a few viral videos recently of kids who “feel all the feelings” and break down sobbing at certain songs. This one makes me laugh because he’s aware that it’s not cool to cry like that, but he likes the way it feels. This one is hilarious because it’s like he’s so touched he can’t contain the tears. And he’s 10 months old. And this one cracks me up because she’s just seems SO SAD and the song has barely started. They all strike a chord because Owen is EXACTLY the same way. Pure, unadulterated, raw, unchecked emotion. All the time. When he was around a year old I would sing to him all the time (ok, who are we kidding… I have sung to him all the time since before he was born and plan to continue long after he starts saying, “Stop singing, Mom. You’re so lame!”). But I rarely know the words to songs, so usually I just make them up about Owen. One of the few songs that I do know the words to is “My Favorite Things” from The Sound of Music. It was our favorite song to sing on the changing table while I zipped him into his sweet little footie pajamas before bed. When I would get to the chorus that says, “when I’m feeling sad”, his brow would furrow, his lip would quiver, and he would CRY. Outright cry. Hard. So hard I would have to stop singing (usually from laughing so hard, but sometimes out of pity that the song was making him so darn sad). Benjamin and I swore we’d get it on video someday (and who knew it could have been a viral internet sensation! ), but alas, it was one of those precious things that just stopped after a while. We picked a new song and that was that. Now it is just a memory I hope I never forget. Fast forward to now. Our song repertoire has grown exponentially, most recently to include the favorites from “Frozen”. If you have a child under the age of 10 (or maybe even if you don’t! ), I’m sure you know it. (And if you don’t, the music is AWESOME). You know the part in “Do You Want to Build a Snowman” where Anna sings, “Ok Bye” when Else won’t open the door? We were singing that together in the bathroom the other night while we filled the tub. I sang the “Ok Bye” line with a little musical theater flair, putting on my saddest face while I sang to Owen. All of a sudden his eyes filled with tears and they spilled out onto his cheeks while he took my face in his hands and said, “Don’t sing like that Mommy, it makes me SO SAD.”. I was simultaneously super proud of my out-of-practice acting skills and overcome with how sweet and emotional my little boy is. He absolutely takes after his father (who could be a viral video himself, crying at every single episode of “Parenthood” while hiding his face from me with a pillow). They both feel all the feelings so deeply. I could not love that about them more. So now it has become a game. Every night at bathtime, Owen challenges me to sing those two words (“Ok Bye”) to him as sadly as I can to try to make him cry. If I come close, he’ll break character and tell me to stop singing because it’s making him too sad. Usually I can’t wipe the smile off of my face long enough to sing those two words without cracking up. Feel all the feelings, kid. You’re in good company. This is Owen’s new favorite game. – It is ONLY to be played while listening to Vanessa Trien’s version of “No More Monkeys Jumpin’ on the Bed” (on this CD). I’m not going to lie, I think it’s hilarious. Benjamin came in while we were playing and was all, “He’s going to hurt himself! He shouldn’t do that! Be careful!”. But I’m appreciating that this game requires relatively little from me, occupies Owen for at least a few minutes at a time, and completely tires him out. Win, win. You know, except for the inevitable concussion. Owen has made up several “games” to several different songs on this CD. We set up chairs like a car and do hand motions to the “Driving in the Car” song. He plays certain instruments with other songs. Who knew listening to a CD could be an entire morning’s worth of activities? 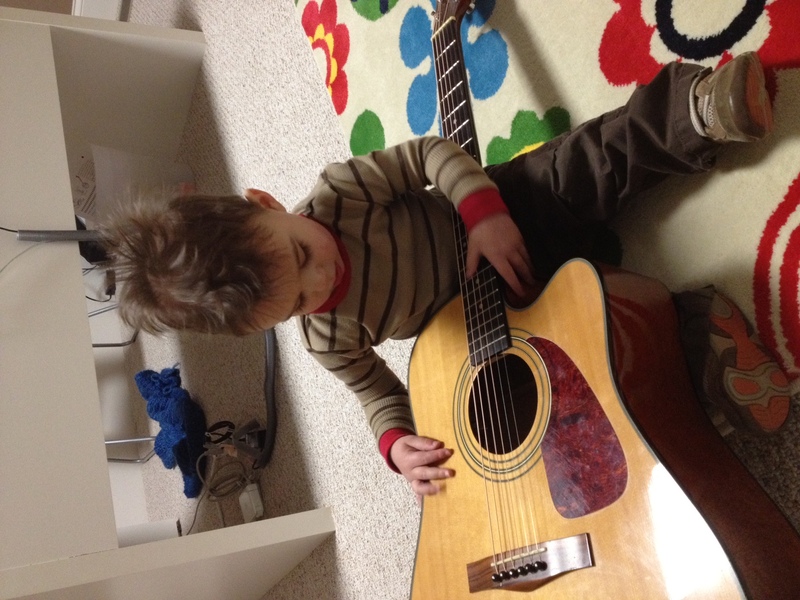 Owen has been “playing the guitar” for many months now. It’s always down on his level in my office and he loves to go in and strum for a few minutes at random. He’ll often sit and sing along too, these days. Always, ALWAYS “Twinkle Twinkle”. Pretty much just like this, but more in tune lately. When he first got interested, he would call it the ‘tar. “Mommy play ‘tar? 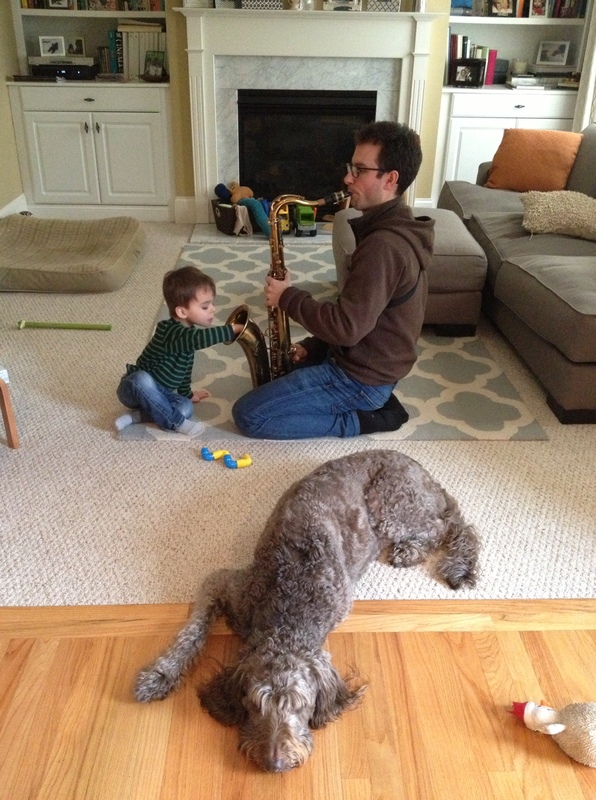 Daddy play ‘tar? Where ‘tar go?”. After a few weeks of repeating the word correctly, he got it down. But recently the word has morphed again. Now he has combined “the” and “guitar” to be “d’guitar”. Except he still puts the “the” in there too. So now it’s “the d’guitar”. It cracks Benjamin and I up so much that we ask him to say it over and over again. “Owen, do you want to play this? What’s it called?” “A d’guitar! Yes! ALL play da d’guitar together!”. “Oh, you mean the guitar?”. “Yup, a d’guitar.”. Side note: Have you seen the movie Game Change? It’s just like how Sarah Palin kept saying “O’Biden” instead of Biden since her brain was thinking Obama + Biden. I guess I can’t make too much fun of the kid. He says “staccato” and “Tchaikovsky” clear as a bell, so his music vocabulary is pretty solid! And, as with many other mispronunciations, I’m sure these will be gone in a matter of weeks. I will miss them when they go. I’ve been singing to Owen since before he was born and I’ve often wondered when he would start singing back. Music is a huge, huge part of our lives. Sometimes I wonder if I sing to him more than I talk to him. We sing lullabies at night, along to CD’s and the radio in the car, we make up songs about everything from diaper changing to making dinner to the ant we saw on the sidewalk. Recently he has started to say, “Sing it?” about everything. And what he means is, “Make up a song about it?”. People listening in on our conversations would think I am crazy. But in the last few weeks, Owen has started singing on his own, unprompted. I hear him working through songs as he puts himself to sleep, or quietly singing to himself in his carseat. My favorite part of this new talent is his “singing voice”. It’s more like a really loud talking voice, so he pretty much just shouts song lyrics. Sometimes he gets the pitches to go up and down at the right places, and once in awhile he can match my pitch if I’m singing, but mostly I just encourage him to shout it out. Even though he can say all of the words very clearly, he seems to turn song lyrics into gibberish, or to smoosh the words together unrecognizably when he’s singing — too many other things to think about, I guess! Singing is ALWAYS accompanied by full-body swaying/dancing. He’s gonna be a STAH! Owen has always had a penchant for all things musical. Remember his emotional piano playing? And his high-pitched singing in the bath? I’ve been singing to him since before he even had ears. These days singing is the #1 way to stop him mid-tantrum or turn his frown upside down. Also the way du jour of getting him to do something he doesn’t want to do (aka changing his diaper or getting in the carseat). Recently he has started singing along with little “doo doo doo”s and “bah bah”s. Complete with head bobbing, drumming, bouncing, spinning, and even putting his arms up over his head like a ‘rina (ballerina). 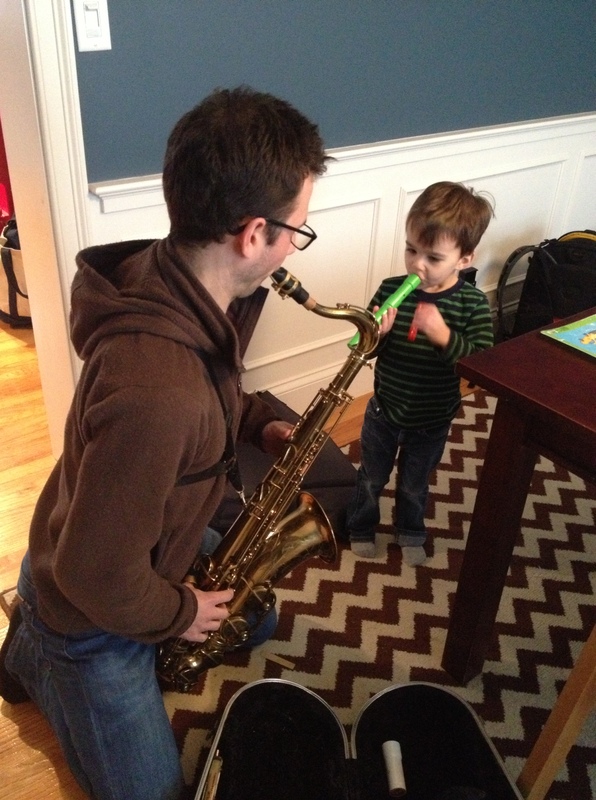 We’re currently doing a Music Together class on Mondays and it is easily the highlight of his week. He loves circle time, playing instruments (especially the drums), singing and moving with the music and being silly with the other kids. But what he loves most of all? When the teacher plays the ‘tar. Guitar, that is. Back in high school I went through the requisite “I’m going to learn to play the guitar” phase that most do. I had a boyfriend who played a lot of guitar at the time and we went guitar shopping for an eternity before we found the one I was sure I was going to play all day, every day for the rest of my life. (A big thank you to my mother for supporting this fleeting passion and buying it for me, even if she knew it would probably end up in my attic someday). Alas, I never played enough to make callouses that lasted or to get very good. The perfectionist in me won out and I lost interest after awhile. Still, it came to college with me and I spent many a night listening to other people play it in my room. 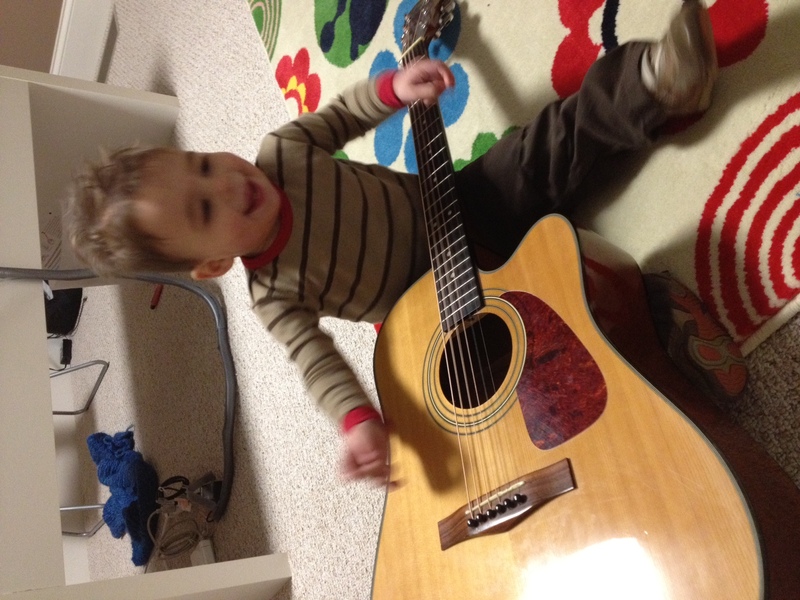 Since then, the guitar has been collecting dust in various spots around our house until Owen recently picked it up. Now it is his favorite toy. I don’t know yet which instrument he will land on (drums? piano? singing? all of the above? 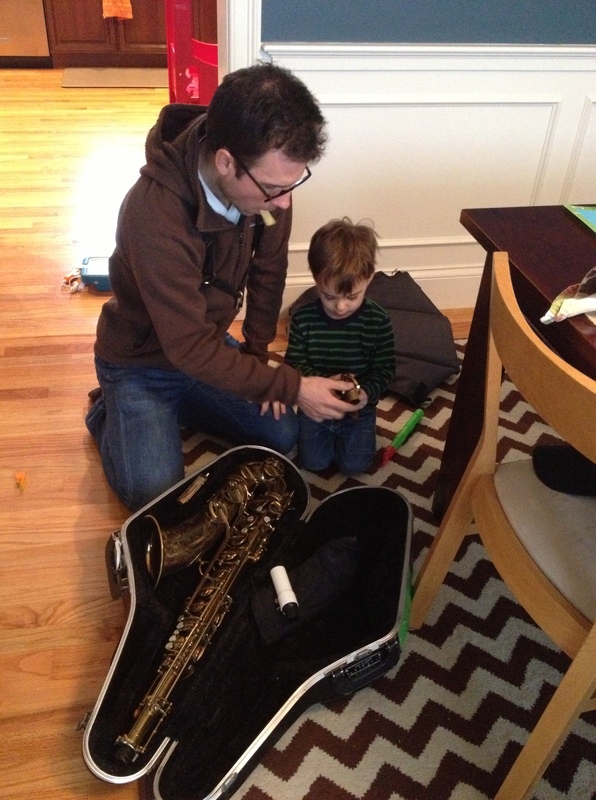 ), but I would put money on the fact that music is going to play a huge part in Owen’s life. We’re planting the seeds now. Did you play an instrument growing up? Did you love it or did your parents have to force you to practice? 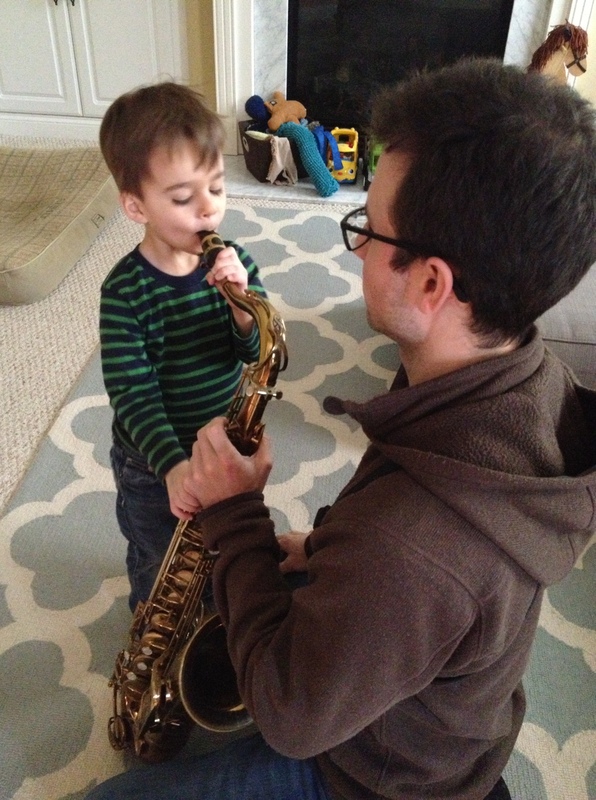 Will you try to encourage your kids to take instrument lessons? What can I say? He’s an expressive guy. 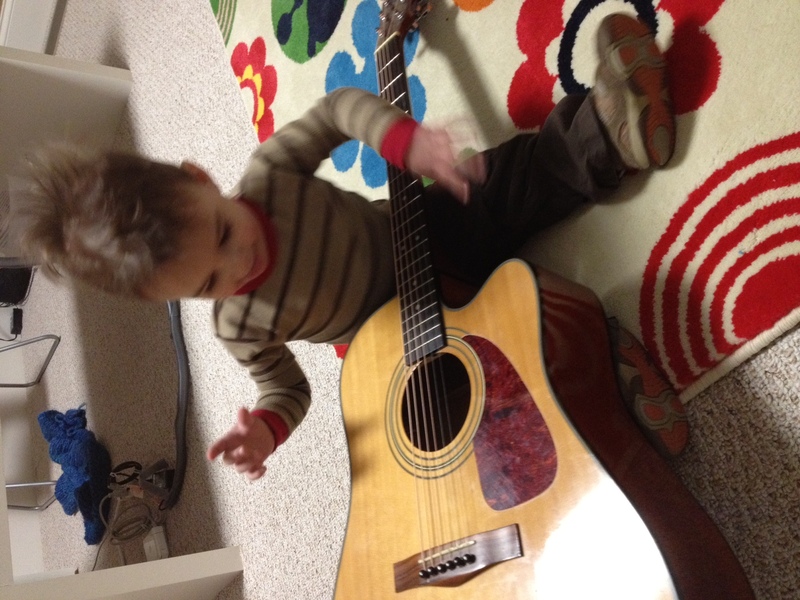 I think we have a little tiny virtuoso on our hands.